Recently, my Old Testament Bible readings came from The Law, the instructions God laid down for his people after he freed them from Egypt. In all of the instances of people needing to be cleaned, whether from disease or touching something unclean or to enter God’s presence, they had to be washed with water, usually their whole bodies and their clothes. That’s when I remembered the important factor I’d left out of the equation. He said water. He meant water. Plain, simple water. This is the God who can turn water into wine (and good wine at that), walk on it, calm it down, and make it into something living. I’m guessing he knows a little bit about its effectiveness to clean people and their stuff. Maybe we make it harder than it is. Just as we don’t need all kinds of ceremonies and fancy prayers to be saved, we don’t need all kinds of chemicals and cleansing agents to be clean. We are saved by a simple confession (Romans 10:9). 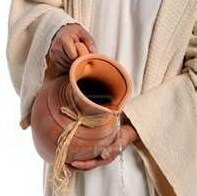 We are baptized simply with water (Matthew 28:19). Clean on the outside and clean on the inside. Yep, hold the bleach. I think a dousing, dunking or drink of water is good enough for me.